Resource: Real Estate Japan Blog | What can I do with a B.A. in Japanese Studies? For those who are studying social science topics dealing with urban planning and demographics, Real Estate Japan started a blog in April 2015 that may be of use to you. 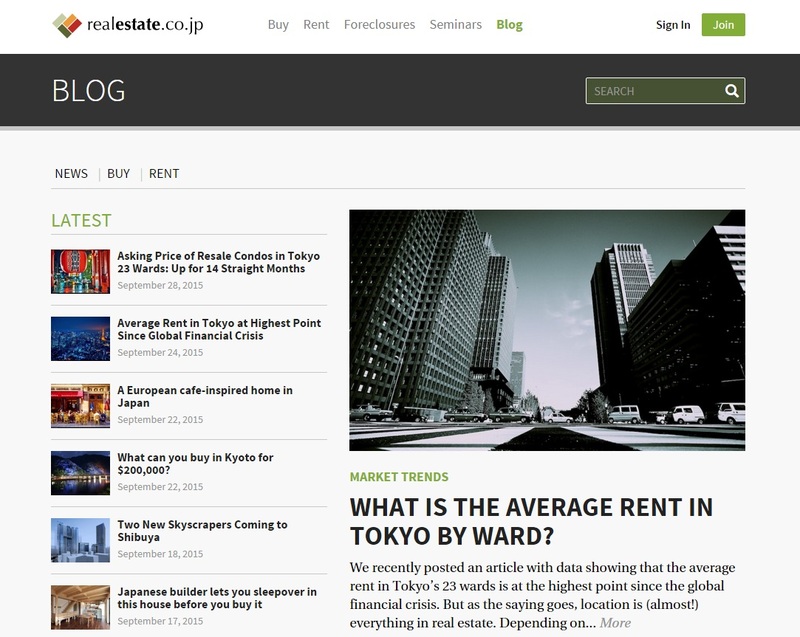 While the English-language site generally focuses on buying and renting real estate in Japan, the site’s blog section highlights information about market conditions, the state of the housing economy, and new developments that could be useful for your research. For example, what’s causing lower prices in the Osaka apartment market? What is the average rate of condo-ownership in Japan relative to other countries and how does that affect rates of renting vs. buying? How do average condo prices compare between Tokyo and Sapporo? What’s the average rent by prefecture? What sort of tenant/landlord issues statistically high? For those researching or interested in environmental design, civil engineering, and architecture, the site also features pieces on housing innovations, such as this home “buried” in Mt. Mineyama, which utilizes geothermal temperature control and architecture that works with the natural landscape of the area, and tsunami evacuation towers as post-2011 architecture. Furthermore, for researchers looking for primary sources, the blog links back to the original sources (often in the original Japanese) of the information. The website also contains glossaries to real-estate terms and tips for buying, selling, and renting as a private individual or an investor. A number of the articles are focused on international citizens living in Japan–financing options for investors, basic requirements for getting a mortgage as a non-Japanese citizen, etc. Whether you’re studying market trends for academic or personal reasons, Real Estate Japan’s blog has a lot of useful content. For information on apartment hunting, check out our series here. This entry was posted in blogs, culture, housing, living abroad, useful links and tagged housing, Japan, real estate, research, resources, social sciences. Bookmark the permalink.